I thought it would be convenient to make a place to collect patterns for cute little thingies: mug cozies (cozies of all types really), ornaments, bottle toppers, gnomes, clothing for gnomes, etc. Things you can knit up quickly that will amuse people. These trees, drink more wine! THAT’S WHAT I’M TALKIN ABOUT RIGHT HERE. From Hunter Hammersen (how can you go wrong with HH? 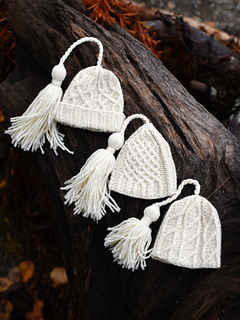 ), the Spicule pattern, three teeny tiny squooshy hat patterns, with matching patterns for adult heads. I’m making my DIL the hat and the ornament to top her package. Score !! And, if you want more, they have so much more! Edited to add: Oooh! and this morning on Ravelry this appeared! They could be used to decorate napkin rings, hair ties, or made into a mobile? I made something similar once as a nail polish cosies for a secret santa gift! Here’s a great pattern…easy and quick. I’m using left over sock yarn. On #20 right now. If you buy cage-free, free range, organic or farm fresh eggs like many folks these days, your eggs are probably brown. Great for chickens! Bad for dyeing Easter Eggs. Not teeny but small, cute, fun, easy ---- all the gals, from youngsters to oldsters, are getting fingerless mitts with matching nail polish. Hmm, maybe this is the wrong forum. So sorry. I’ll head over to the gift-a-long! I made quite a few of these little gnomes last year - the knitting was fun and the assembly wasn’t too bad once you locate all the wood items. I have made bunches of these in the past: Tiny snowpeople from Anna Hrachovec, on her website or Ravelry. Non-denominational, adorable alone, amazing as a snowperson squad. These are all I’ll probably manage. Want to make a whole herd! Bringing back memories of our bag of finger puppets. Mostly not knit, I just collected them wherever. Where did that bag get to? Those are super fun! could do them with corks as well! P.S. I transposed the pattern to knit in the round rather than flat and then have to sew up tiny seams. What about Julie Williams’ Christmas Stocking pattern on Little Cotton Rabbits? People in my knitting group made some of these to contain folding money gift for teens in their families. And it is free. I knit a small forest of those one Xmas. Every year they come out and sit on my living room mantle (because if they are on the coffee table the younger nieces and nephews walk off with them). In other words, they are great toys as well as decorations.